Go to the instrument booking calendar. For help locating the booking calendar please see the guide [Navigating to the instrument booking calendar]. A table should appear displaying all of the machines/methods for which you have the permission to view availability, request booking slots, or book slots for yourself and others. 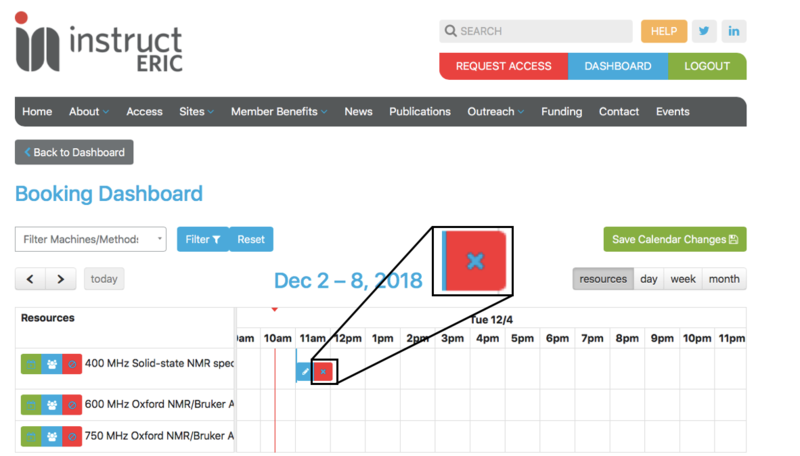 If the calendar is empty please contact the facility hosting the machine/method you wish to book and ask them to change your user permissions for the machine. If you are a machine/method administrator and wish to change user booking permissions see the guides Configuring machine bookings and Managing user training status. Filter the booking calendar for a particular instrument by clicking in the box labelled "Filter Machines/Methods" and typing/selecting the desired instrument(s) from the list. Click the "Filter" button to confirm the selection and filter the list, and click the "Reset" button to remove the selected filter. After resetting, click the "Filter" button again to restore the full list of bookable instruments. "resources" view (default) - to see all available instruments as rows in a table, and time slots (hourly) as columns in the table. Scrollbar at the bottom of the table allows navigation through time slots for the current week. To change the week click the arrows to the top left of the table. "day" view - to see all bookings for a particular day. Bookings are shown in a table with rows for each (hourly) timeslot, and columns for each (filtered) bookable instrument. To navigate to other dates, click the arrows to the top left of the table. "week" view - to see all bookings for a particular week. This will show bookings for all (filtered) instruments. To navigate to other weeks, click the arrows to the top left of the table. "month" view - to see all bookings for a particular month. This will show bookings for all (filtered) instruments To navigate to other months, click the arrows to the top left of the table. Click the red cross button on the booking to cancel the booking. If there is no red cross button on the booking you wish to cancel then you do not have sufficient permission to cancel the booking yourself. Please contact the machine administrator for further assistance in cancelling your booking. If you are a machine/method administrator and wish to change user booking permissions see the guides Configuring machine bookings and Managing user training status. For information on how to decline a booking request see the guide Declining a machine booking.